The Savannah River Site (SRS), a 310 square mile (198,046 acres) Department of Energy site, is located in the sand-hills region of South Carolina. It encompasses parts of Aiken, Barnwell and Allendale counties and is bordered on the west by the Savannah River and Georgia. 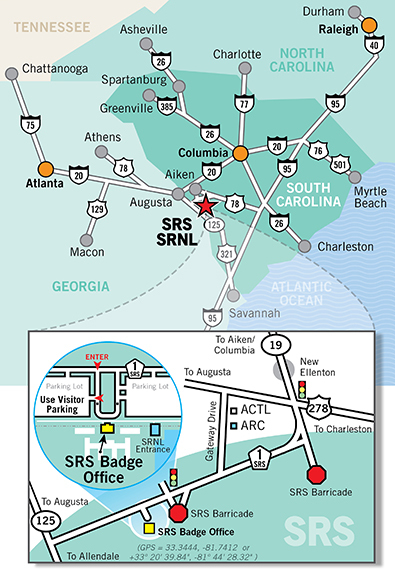 SRS is close to several cities, including Augusta, Georgia and Columbia, South Carolina. It is also within a few hours of Atlanta, Savannah, Charleston, Greenville and Charlotte. Click here to read the SRS Overview booklet. click below to download directions and maps. Monday-Thursday . . . 6:30 a.m. – 4:00 p.m.
Fridays . . . . . . . . . . . . .6:30 a.m. – 3:00 p.m.
Click here for SRS Tour information.